Good Shepherding is all about feeding the lambs and the sheep, bringing them together in good pastures. It is about making sure they have enough water, and that when needed the sheep are groomed, clipped and sheared. It is about delivering new lambs, and leading the sheep. It is about going to find them when they wander and returning them to the fold. It is about protecting the sheep from danger. Our Lord Jesus is the Good Shepherd and we as his people are his sheep. Just like sheep, we need feeding. Our Lord feeds and nourishes us by the true word in the Holy Scriptures. We are given water by baptism into the Holy Spirit. The Lord grooms us by keeping us clean and free from the contamination of the world through his forgiveness of sins for all who truly love and believe in him. When we need it, we are sheared by discipline. He encourages and rebukes us so to prepare us more fully for eternal life with him. The Lord delivers new lambs as we are born again in newness of life in him. The Lord protects us and saves us from sin, the evil of the devil and from death. A Good Shepherd will lay down his life for his sheep just as the Lord Jesus willingly came to earth, was made man and willingly suffered death by being crucified on our behalf so that our sins would be forgiven and we could have the chance of eternal life in him. 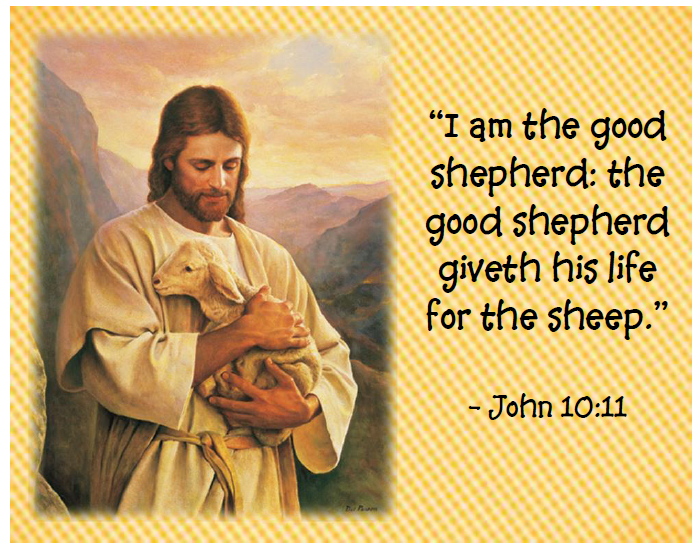 (JN 10: 11)-I am the good shepherd. A good shepherd lays down his life for his sheep. Let us thank the Lord with all our hearts for Him being the Good Shepherd, who loves each and every one of us, even though we are not worthy.